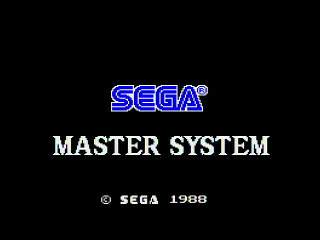 All hail the Master System! All other systems are lesser, slave systems! Getting old is a strange thing. Remember how we all used to play video games to avoid things like reading or doing book reports for school? Well, now that all of us old fogies are all grown up, what do we want to do? Read books about video games, of course. Well, old men and women, fogies, geezers and hags alike, if you’ve got the itch to read about some retro games and it’s not an itch that your regular hemorrhoid cream can fix, then stop scratching because Video Game Archeologist Derek Slaton has a prescription for you in the form of The SEGA Master System Encyclopedia. Now leave the “book report” part up to me, you old farts. Calling the book an “encyclopedia” is a bit of a misnomer. I personally feel that calling it a “Player’s Guide” would have been a bit more apt, as inside the book, Slaton has collected his own reviews of nearly every US released game for the Master System. 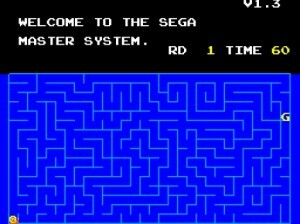 I say “nearly” every game only because he does not include two games, the first being Snail Maze, which was a game hidden away in the original Master System console itself and accessed only with a secret code. The second absent game being Sports Pad Football, which, as Slaton correctly points out, is 98% the same game as Great Football, so why waste the paper? Belying the encyclopedia part of the title even further, Slaton states at the outset that his reviews are “equal parts informative and entertaining,” and they are mostly written in an approachable, informal style consistent with this purpose. So if you’re worried that his book is just a collection of information that can be found on the Internet, worry not. Each of the reviews reflects Slaton’s own unique take on the games covered. The trade-off is that there are no system specs (Sorry dorks, no dork food for you! ), no information about the various peripherals outside the context of the game reviews, or discussions of the overall system’s history. So if you are looking to read about super-scaler technology, SG-1000 compatibility, or even Yu Suzuki, you’re out of luck, as none of these terms appear in the book. The SMS Encyclopedia focuses solely on the games. Otherwise, you’ve still got 111 games to read about, which ain’t too shabby. While the pages themselves are oddly not numbered, the games are arranged alphabetically, so your own kindergarten-level of literacy will help you navigate to where you need to go if you are perusing for a particular game review. For those curious about how much bang for their buck they are getting in the form of dead trees, I did painstakingly count the total number of pages for you all because I’m altruistic like that. I counted 435 pages (I then later saw the listing for the book on Amazon which showed the page count to be 435 pages, and I therefore had the urge to cut myself just a tiny bit). Welcome to the Fantasy Zone! Get Reading! Something that I really appreciated about the book was that each game was given roughly equal attention, no matter if it was good or bad. Whether they were pure nuggets of gold like Power Strike or Spellcaster, or they were absolute Montezuma’s revenge like Montezuma’s Revenge, every game has three or four pages of gameplay breakdown and a splash of screenshots to represent them, with only a handful of exceptions (Phantasy Star has five pages and Shooting Gallery has only two, both of which are understandable, but Teddy Boy getting five whole pages? I mean, trees die to give us paper, am I right?). Derek Slaton recommends “Bomber Raid.” You should listen to Mr. Slaton. Like I mentioned before, this book is organized very much like a Master System player’s guide, but unlike other player’s guides for lesser systems of the time (there was this other console back then, some ugly gray, boxy thing that came with a robot), this guide is clearly not written by a marketing firm trying to sell you a copy of each and every game. Each of Slaton’s articles are essentially a review without any kind of score assigned, so if he didn’t personally care for the game, he is very upfront about it. He certainly isn’t trying to peddle games like Pro Wrestling or F-16 Fighting Falcon on anybody. The first page of each article includes the U.S. release date, developer, publisher, genre and number of players for each game. 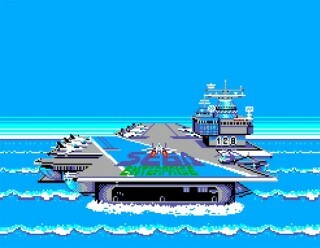 These opening pages are also adorned with an image of the game’s title screen and box art, while each page following is paneled with several in-game screenshots. Most of the time there is plenty to look at, and the images do a sufficient job at illustrating Slaton’s descriptions. Yes, several a guffaw will be guffawed. Humor aside, having spent quite a bit of time with most of the games in The SMS Encyclopedia, I would say that his gameplay accounts are more than adequate to give the reader a good idea as to what to expect from each game. 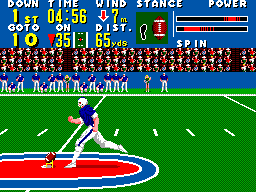 Slaton also outlines several of the key differences you will find between arcade versions of games and their respective SMS ports, such as limiting your character selection in Golden Axe, the perspective change in Zaxxon 3-D, and the absence of the “Rise from your grave!” voice in Altered Beast (criminal). He also contrasts the SMS ports of games like Strider and Paperboy with their counterparts on other consoles (in these cases, the SEGA Genesis and the ugly gray robot box, respectively). 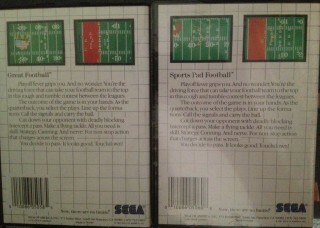 NOT an actual Master System game… but it should have been. Now this is where I have to put on my everlasting-know-it-all hat, I suppose. 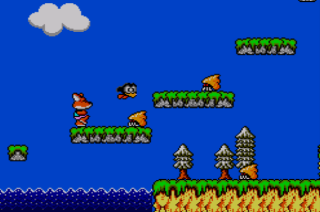 The SEGA Master System was the first console I ever owned as a kid, and between owning, renting and borrowing games, I have some kind of first-hand knowledge of all but nine of them. That said, I found two errors in the book, the first being that Fantasy Zone: the Maze is referred to as “Fantasy Zone 3.” Certainly I’ve heard or read others refer to the game as such, but my nerd rage demands that I mutter through my clenched teeth that the official title is still Fantasy Zone: the Maze. The other error is that Slaton claims that there are no boss battles in After Burner. 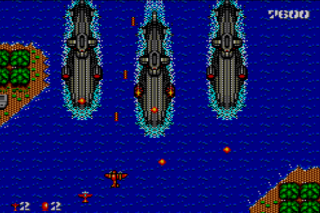 While the arcade game and other ports do not include any bosses, the SMS version has a boss inserted into it, which is known as the Flying Fortress. I know he’s there because he haunted my nightmares as kid, and I would cry and whimper in my sleep, “Why? Why Flying Fortress? Why are you so hard to shoot down?” Pathetic? Levying criticisms at the book as a whole, multiplayer experiences aren’t particularly well characterized. While Slaton has clearly spent a decent amount of time with each of these games, some of the experiences change pretty dramatically when a second player is thrown into the mix. For instance, a game like Rampage is 100 percent more fun with a friend along for the destruction, and Rambo: First Blood Part II becomes much easier when you have a second player along with you to watch your back (Everyone remembers Rambo’s yellow headband wearing sidekick, Zane, right?). When are the “Psycho Fox” characters finally going to be folded into Sonic the Hedgehog’s continuity? Make it happen, SEGA! The book is also a bit lacking in its descriptions of the music of most games. Sure, screenshots do such a good job showing how a game looks, but they obviously can’t express how a game sounds. He does mention games like Thunder Blade, Fantasy Zone and OutRun as finer examples of the SMS tunes and also points out the lazy recycling of national anthems between the “Great” series of sports titles, but how does the Ghostbusters theme sound on the Master System? How do the 8-bit chiptunes translate the music of Michael Jackson’s Moonwalker? Yes, gameplay is paramount and presentation should always be secondary, but sometimes aesthetics are still a big part of the experience. Finally, there are also times when an article paints a negative picture of a game until the very end, where in the last few lines of the review Slaton still recommends the game. While reading his opinion on Alex Kidd in Miracle World and Kenseiden, I thought that Slaton must have hated both games, but in his closing remarks, he still suggests that they are very worth picking up, nonetheless. I list this as a criticism not because I expect him to like all of the same games as I do, but only because I don’t think this is always intentional. Reviews such as these probably could have included a bit more information as to the better qualities of the games, which would have led to a more balanced final conclusion. But is it the Captain Silver Standard? Even as well acquainted as I am with Master System games, I still learned a thing or two. For one, I forgot that the SMS version of Monopoly has a battery save in it, allowing you to suspend a game until later (which was a great idea). Not only that, but I also now wonder how I never played Cyborg Hunter before. I must have conflated it with Cyborg Justice on Genesis and blown it off, but Slaton’s description of the game made me really curious about it, and now I’m itching to give it a go. Derek Slaton recommends “Walter Payton Football.” Again, you should listen to Mr. Slaton. So would I call it recommended reading? If you are completely new to the Master System library or are a collector looking for ideas on where to focus your future collecting, thumbing through Slaton’s tome isn’t a bad place to start. If you are a SEGA Master System native, and you know the SMS library like the street you grew up on, you may not find much information here that is particularly valuable, but it is in the least, still quite enjoyable. It’s also really great to see some truly fantastic games being given a little bit of love as they were unfortunately overlooked as early casualties of the Console Wars. I should also mention that, if you’re still on the fence or just not into mass tree genocide (again, the book is 435 pages long), there is a digital version of The SEGA Master System Encyclopedia sold through Derek Slaton’s website, which is quite a bit cheaper in that digital format as well ($10 at the time of this writing). This digital version not only has brighter screenshots that are more indicative of the rich SMS graphics, but includes gameplay videos as well. Unfortunately, the book doesn’t cover “Snail Maze,” a simplistic game hidden within the Master System 1 which, as you can clearly see, is the canonical prequel to the Phantasy Star series. *Image courtesy of my brother, Clayton Worrell’s super-sweet SEGA collection. A copy of The SEGA Master System Encyclopedia was provided to SEGA Nerds by the author. You can purchase a copy of The SEGA Master System Encyclopedia through Amazon or directly from the author’s website.